She was the beautiful and ill-fated gypsy maid in Hugo's Hunchback of Notre Dame - passionate and faithful. 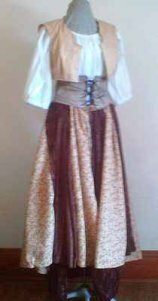 #H132 Full gored skirt in contrasting colors with vest and peasant blouse. Laced belt and harem pants.